In his memoirs, former UK Defence Secretary Sir John Nott describes France as Britain's "greatest ally" during the Falklands War. But formerly secret papers and other evidence seen by the BBC show that was not the full story. Before the war, France sold Argentina's military junta five Exocet missiles. At the time, few suspected that the regime's longstanding claim on the Falklands would lead to war, and the sale went largely unnoticed. But when in May 1982 these Exocet missiles were used to strike Britain's HMS Sheffield and Atlantic Conveyor, with the loss of 32 British lives, near panic ensued in London. At the start of the conflict, France's left-leaning president, Francois Mitterrand, had come to Britain's aid by declaring an embargo on French arms sales and assistance to Argentina. 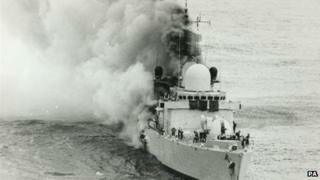 He also allowed the Falklands-bound British fleet to use French port facilities in West Africa, as well as providing London with detailed information about planes and weaponry his country had sold to Buenos Aires. Paris also co-operated with extensive British efforts to stop Argentina acquiring any more Exocets on the world's arms market. But Mitterrand's policy of supporting Britain provoked dissent among some senior officials in the French foreign ministry. In a stinging memo dated 7 April 1982, France's then ambassador to London, Emmanuel de Margerie, described British Prime Minister Margaret Thatcher as "Victorian, imperialist and obstinate". He went on to add that she had a "tendency to get carried away by combative instincts". In another document entitled The Falklands: Lessons from a Fiasco, senior French official Bernard Dorin accused Britain of "superpower arrogance" and claimed the country had shown "profound contempt for Latinos". Behind the scenes, actions were speaking louder than words. In what would appear to be a clear breach of President Mitterrand's embargo, a French technical team - mainly working for a company 51% owned by the French government - stayed in Argentina throughout the war. In an interview carried out in 1982 by Sunday Times journalist Isabel Hilton, the team's leader, Herve Colin, admitted carrying out one particular test that proved invaluable to Argentinian forces. "The verification process involves determining if the missile launcher was functioning correctly or not. Three of the launchers failed. We located the source of the problem and that was it. The rest was simple." The BBC made efforts to contact Mr Colin to request an interview, but received no response. The French company he still works for, Dassault, told us that after 30 years that it was unable to confirm whether or not it had authorised the work his team carried out in Argentina at this time. But it is now clear that, thanks to tests they carried out, the Argentinians were able to fire Exocets at British forces from three previously faulty missile launchers. Francois Heisbourg, who at the time was international security adviser to the French Minister of Defence, Charles Hernu, insists that his government did not know that the technical team was there. But, he says, the fact that it evidently was is inexcusable. "It is now undeniable and... one should not belittle it. This was not what was supposed to be done. It is the sort of thing which mars what should otherwise have been picture-perfect co-operation between the two countries," he says. But not all in the French government were in the dark about the technical team's presence in Argentina during the conflict. Pierre Lethier, former chief of staff of the DGSE - the French equivalent of Britain's foreign intelligence agency MI6 and signal intelligence headquarters GCHQ - admits that his department did know about them. "This is what intelligence is for. You need sources. We had difficulties to penetrate the Argentinian army at that time during the Falklands conflict. So, the more helpers you have the better you are," he says. Lethier told me that the DGSE had an informer among the members of the technical team who was able to give them some information about what the Argentinian military was doing. But he is fiercely critical of the French team for the technical help it gave. "It's bordering on an act of treason, or disobedience to an embargo," he says. "I mean, it's clear that if the head of state in France decrees an embargo, it's an embargo. Full point." Britain's Defence Secretary at the time, Sir John Nott, told me that although he knew that a French technical team was in Argentina then, its work was not thought to be of any great importance. British efforts, he insists, were mainly focused on stopping the Argentinians getting hold of any more Exocets. Had he, I enquired, asked Paris to withdraw the team? That, he could not remember. Overall, he added, the French did give Britain substantial help during the conflict. "We asked Mitterrand not to give assistance to the Argentinians. If you're asking me: 'Are the French duplicitous people?' the answer is: 'Of course they are, and they always have been.'" Documentis broadcast on BBC Radio 4 at 20:00 on Monday 5 March.